Sometimes it's just a little bit more fun to give your wife or husband a Funny Anniversary Poem. This poem is so cute we think your spouse will really enjoy your sense of humor. Perfect for any year anniversary...especially if you've been together for awhile! Instead of a greeting card for this year's anniversary, consider giving your spouse an anniversary gift that will surely bring a smile to his or her face. 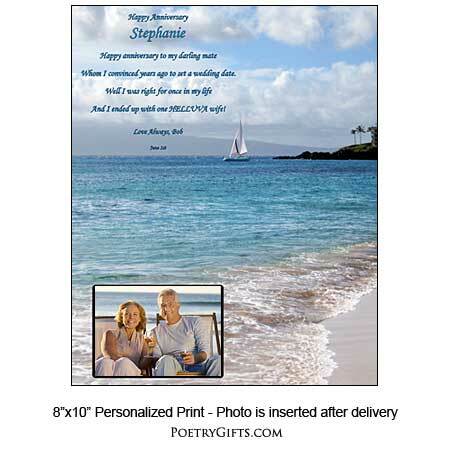 Our Funny Anniversary Poem is light-hearted and when it's personalized with names, a closing message from you, and a cut-out photo area for a picture of the two of you, it becomes an anniversary present to remember. 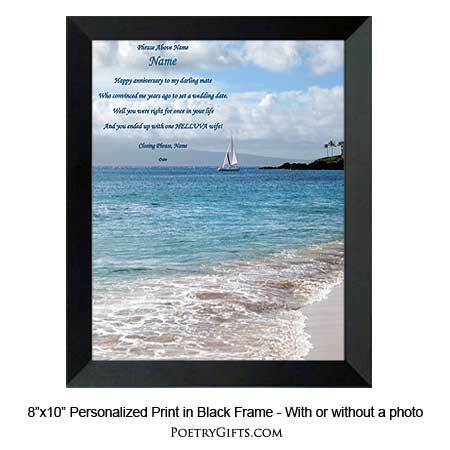 You can choose to frame the poem yourself in any standard 8" x 10" picture frame or you can choose from our modern black wooden frame or sleek metalic silver frame. 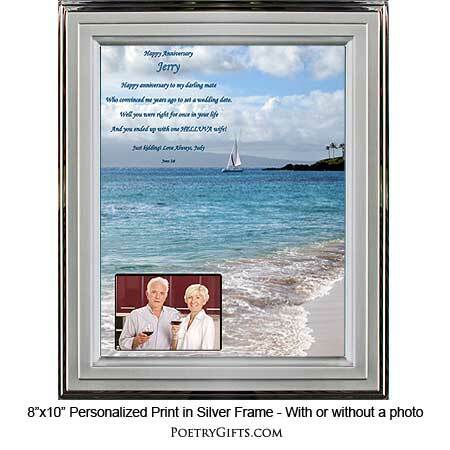 ($19.95 is the unframed price) The best part is...your husband or wife can display this present on a desk or table and enjoy reading it throughout the year. 3. Closing Phrase and Name (as seen after poem) - Examples: Just kidding! Love, Mary; Love Always, Sam; After All These Years...You Got To Laugh! xoxo Katie; etc." Whom I convinced years ago to set a wedding date. And I ended up with one HELLUVA wife! Who convinced me years ago to set a wedding date. And you ended up with one HELLUVA wife!